The annual Motorola Channel Partner Conference was held in the Barossa Valley in South Australia this year. Each year at the Gala Dinner, Motorola present awards for sales and marketing to top performing companies. Along with these company awards, Motorola award a Silver Fox Award to an outstanding individual who demonstrates leadership, drive and a commitment to the industry. 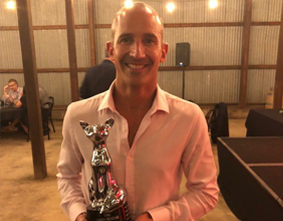 This year the Silver Fox Award was presented to our very own Telecommunications General Manager – Ben Marshall. CSE Crosscom were awarded the Australian Radio Partner of the Year for the second time running. This award is given to the Channel Partner with the top performing sales over the previous year.